Quarterback: If you were to ask me this question before last year’s playoff tilt against the Saints, I’d say it might be time to see what the Seahawks have in Charlie Whitehead. 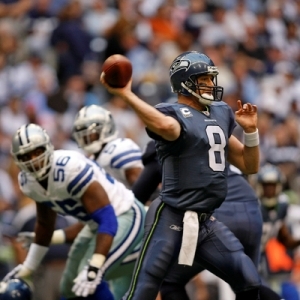 Lets face it for much of last season Hasselbeck looked uninspired. He seemed to be an aging quarterback on a fading team and out of nowhere came this masterful playoff performance. Against the Saints he threw for 272 yards, 4TDs and only 1 interception. He was even better in the loss to Chicago where after a mediocre first half, he wouldn’t let his team quit. His 258 yards and 3TDs withstanding, it was his leadership and inspirational play that rallied the Seahawks to finish with a flair. What happened?? Who was the guy wearing #8 for them in the regular season?? You know the guy who threw for 3001 yards, 12 TDs with 17 interceptions and a dismal 73 quarterback rating. Lets see if we have this right…14 regular season games 12TDs v. 2 playoff games and 7TDs. Tell him they’re all playoff games and Hasselbeck may throw for over 50TDs this season. Offensive Backfield: Well here we are with the University of Cal Golden Bears backfield of 2007 with Marshawn Lynch starting and Justin Forsett backing him up. Oddly enough Forsett had slightly better numbers when he was in the lineup with a 4.4 yards per carry average. As with the case with Hasselbeck, Lynch didn’t seem inspired until the post season. With that thunderous 67 yard run in last year’s playoff win over the Saints, he showcased what he can do and what he possibly could be. That has been the problem, he showed a flash here and there in Buffalo yet would slip back into an easy to tackle, marginal running back. Last year Lynch rushed for 573 yards on 165 carries for a 3.5 yard average and that has to improve for this team to return to the playoffs. Forsett is better suited as a 3rd down back. He shows burst, just not the bulk you want in a runner when its time for the 10 play 75 yard clock killing 4th quarter drive. Evidence of this is he only scored twice rushing the football to Lynch’s six. He plays better in space when a defense isn’t keying on him. He rushed for 523 yards and caught 33 passes for another 252 yards out of the backfield. Decent but not spectacular. At running back the Seahawks are below average. This group just doesn’t pass the eyeball test and when focused upon is easily stopped. 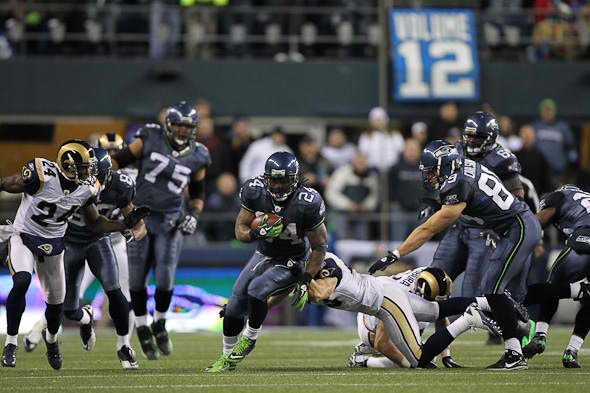 As a team, they only had 6 games where the Seahawks ran for more than 100 yards. Thats an indictment of their line but also their backs who rarely make plays in space. Maybe thats why the roar of the crowd was so loud on that playoff run by Lynch. This team should have drafted a running back. Receivers: This was a position in flux over the entirety of 2010. First they released T.J. Houshmandzadeh before the season. They traded Deion Branch back to the New England Patriots and shuffled their receivers to the tune of 5 different starters over the course of the season. Former USC WR Mike Williams resurrected his career and was fairly productive between the 20s catching 65 passes for 721 yards yet he only scored 2 times. Then in the draft the Seahawks draft the same type of receiver in Kris Durham who is 6’5 and 215 lbs, another possession type receiver with not much burst. Why would you need two of the same type of receiver when you lack playmakers?? Puzzling selection to say the least. The Seahawks did have 2 younger receivers come to the forefront in Deon Butler and Ben Obomanu, who could be the match set of receivers for this team in the near future. Butler caught 36 for 385 yards, while Obomanu caught 30 for 496 yards, and they each scored four times. Golden Tate out of Notre Dame rounds out this group and is trying to learn the pro game at receiver after switching to receiver from running back in college. He did grab 21 receptions for 227 yards yet showed nervous hands which is understandable for a young receiver. He is suited to the slot receiver role in a 3 receiver set where he can come out of cuts quickly and get up field after the catch. Unless one of these receivers has a breakout year, this group is slightly below average and doesn’t pack a punch. Offensive Line: Aha, we found the source of the offense’s problems. Do you realize this team was 31st in rushing yards, 30th in rushing average as a team (3.7 yds per carry) and was 16th in allowing their quarterback sacked 35 times?? Come on you have to be good at one of them don’t you?? This team could only power the football for the first down 54% of the time up the middle and 57% of the time on 3rd and 2 or shorter. When push came to shove this line didn’t get enough push. Now here are some well spent draft picks. First they took James Carpenter in the 1st round, a 6’4, 321lbs. mountain of a man who was a blocker for 2009 Heisman winner Mark Ingram at Alabama. Will he be a guard or a tackle? Hmm.. They spent their 2nd selection on Wisconsin G John Moffitt, who at 6’4 319lbs can come off the ball and punish linebackers if he gets to the 2nd line of defense. Hopefully this team will run the football with more regularity this season keeping pressure off these rookies when it comes to pass protection. One of the reasons the sack total was higher than anticipated was rookie T Russell Okung settling into his LT spot. If he meshes with the two young studs they drafted this group could come off the ball and really improve the Seahawks ability to run. The question is will the coaching staff call those running plays as often as they should? They didn’t draft these guys this high to sit the bench. 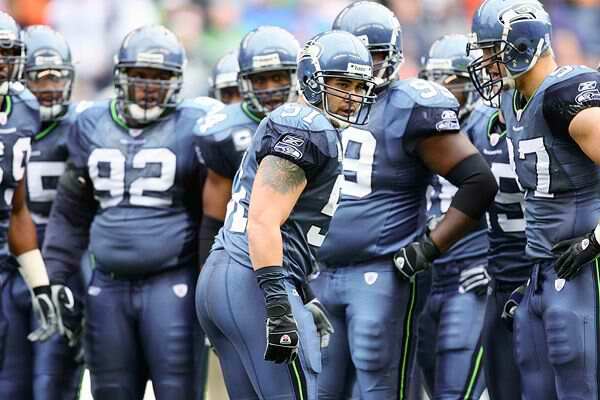 The Seahawks never adequately replaced Steve Hutchinson from a few years back. They may have finally done so. We’ll give the offensive line a grade of average for now until we see these guys take the field. If they return with the regulars from last year, completely below average. 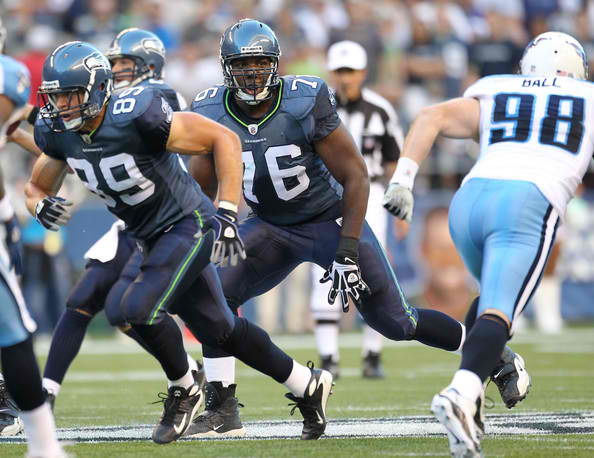 Defensive Line: Surprisingly the Seahawks had a decent pass rush that produced 37 sacks in 2010. Not a bad total for the league’s 27th defense. That total was high enough to rank 13th in the NFL for rushing the passer. Chris Clemons swo0ped in for 11 sacks, while former Colt and current pass rush specialist Raheem Brock came in for 9 sacks as well. This was the bulk of the Seahawk pass rush with several rushers coming on for 1 sack a piece. DT Brandon Mebane teamed with Junior Savii for not only 2 sacks from the defensive tackle’s sacks they combined for 43 tackles. That isn’t enough and they need to get enough inside push to offset the pass rushing from the outside. The Seahawks were a dismal 21st against the run and couldn’t stop their opponents when they needed to. They could use a boost here. They did draft Levingston Lazarious in the 7th round from LSU, but at 6-4 292lbs, he seems suited to play end more than tackle. This defensive line is below average and am surprised they didn’t make more of an attempt to address this in the draft. Linebackers: The strength of this defense can be found in this linebacking corps. 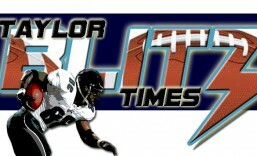 Lofa Tatupu, David Hawthorne, and Aaron Curry started all 16 games and made plays all over the field. It was OLB Hawthorne who led the team in tackles with 105 tackles, he forced 2 fumbles and did have one interception last year. Yet it looks like the brass is trying to replace him. They used two draft picks on outside linebackers K.J. Wright in the 4th and Malcolm Smith in the 7th from Pete Carroll’s USC tree. This could push him to have an even more spectacular 2011 campaign. Lofa Tatupu is a solid MLB, but I expected him to make more splash plays than he does. He’s instinctive and solid diagnosing the play but if a lineman gets on him he doesn’t shed blocks that well. He did shed enough blocks to make 88 total tackles and had 1 sack, an interception and forced one fumble. Just a little more out of Tatupu and …. Which brings us to #1 draft pick Aaron Curry out of Wake Forest. At 6’4, 250 lbs., this is a linebacker that can really run. He made 70 tackles, forced 2 fumbles and had 3.5 sacks when he did blitz. His 3rd year should be a breakout year for him now that he is used to the pro game. He can get to the flank and defend against the pass and should intercept a few passes this year as well. Last year you could see plays where he was a half step off in recognizing specific plays, with his athleticism and study those will be turnovers this year. He should make his first pro bowl in 2010. Watch this kid… Linebackers are good with a chance to be great if Lofa could just…. Secondary: This was an active secondary. 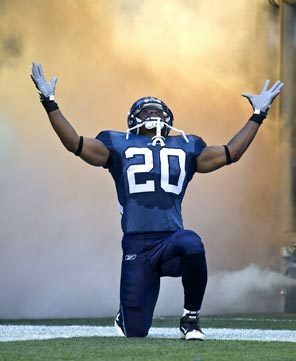 SS Lawyer Milloy had a real good year logging 89 tackles and 4 sacks on blitzes. He also forced two fumbles yet I can’t remember the last time I saw him intercept a pass. He has always been beatable when you can get him to cover man to man. See last year’s TD play by Greg Olsen (The U) in the playoff loss to the Bears. He’s muscular and hips don’t swivel that well yet in a zone or phonebooth (near the line of scrimmage) he is as solid as they come. Age is a concern though and at 38 he could age in a hurry during the season. Earl Thomas had a good year at FS leading the team with 5 interceptions and had 71 tackles which was 5th best on the team. Corner play was up and down with Marcus Trufant and Kelly Jennings (The U). Jennings play picked up when he returned to the lineup from injury. Although he missed 2 games he led the Seahawks with 13 passes defensed and may be rounding into a solid NFL corner. Trufant often got his nose dirty making 80 tackles which was 4th on the team. So where is the down side? As a tandem, they only had two interceptions which prompted them to draft CB Richard Sherman from Stanford and CB Byron Maxwell from Clemson. One way or another they should get more active corner play. It looks like they will move Marcus Trufant to SS to replace Milloy since he is willing to tackle and is 8 years younger. The Seahawks are slightly above average and are the beneficiary of a weak front that doesn’t put teams in obvious passing situations. However they were exposed in the playoffs by Jay Cutler and Drew Brees and looked tired at the end of the season. They need help from the defensive front. Overall: After all this research we still don’t know who the Seahawks are. If they can get the return they expect from their top two picks on the offensive line this can be a much improved team. Lynch will have a 1,000 yard season and they could win 10 games. Still can’t make since of their picking two linebackers when one led the team in tackles and the other is on the verge of stardom. Why not pick up defensive line help? Puzzling… This team is puzzling and we have to wait and see which Matt Hasselbeck comes into the new season. Will they make it back to the playoffs? Still unclear however they have to watch out for the Rams. 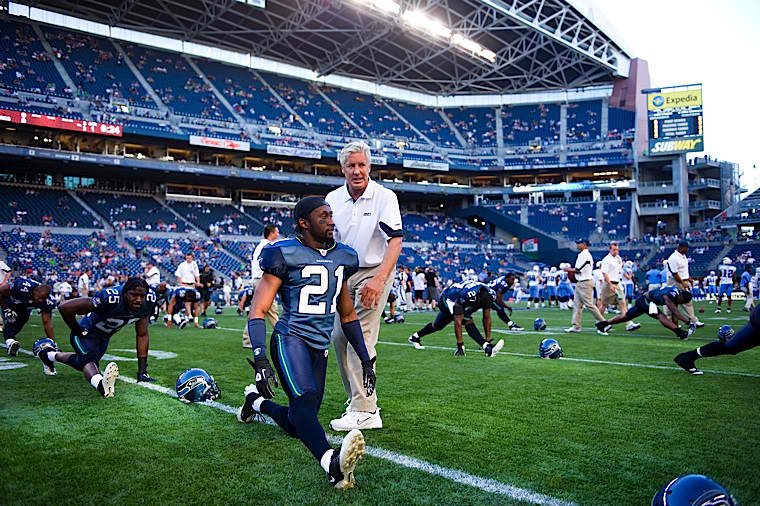 This entry was posted in 2011 Team Previews and tagged football, football preview, football teams, NFL, Pete Carroll, Seattle Seahawks, The U, USC. Bookmark the permalink. 37 sacks for a team that was playing against offenses that were ahead in the score and primarily running the ball is pretty impressive.